The first scientific laboratory experience for Michael Pierce, director of the UGA Cancer Center, wasn’t glamorous. He got a job cleaning glassware and mixing solutions as an undergraduate at Oklahoma Baptist University. It was grunt work, but the lab was a place of discovery for Pierce, now a Distinguished Research Professor of Biochemistry and Molecular Biology in the Franklin College of Arts and Sciences. It’s where he decided that he wanted to be a researcher. Pierce and other UGA faculty are paying forward that valuable laboratory experience to high-achieving high school students through the UGA Young Dawgs program. Run by the university’s Human Resources office, the program offers experiential learning opportunities in the form of internships to high school juniors and seniors with a GPA of 3.6 or higher. During the fall and spring semesters, the program largely serves Athens-area students; it is open to students across the state during the summer. Many Young Dawgs students are accepted and enroll at UGA and some go on to participate in the university’s Center for Undergraduate Research Opportunities. About half of the students choose an internship in a science, technology, engineering or mathematics, or STEM, field, offering them science education opportunities that few students get in high school. Now in its ninth year, the Young Dawgs program has provided more than 110,000 internship hours through nearly 1,000 internships to date. That success, said Geiser, is because of faculty members, like Pierce, who agree to take these students and show them what research looks like in practice. “These are people with tons of other stuff to do, but they agree to create these life-changing experiences for the kids,” Geiser said. 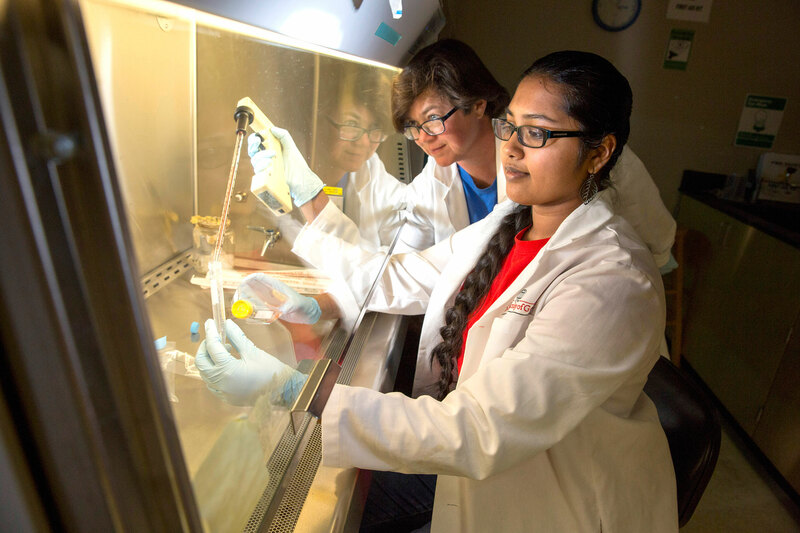 Suvitha Viswanathan, a junior at North Oconee High School, is one of the students studying in Pierce’s lab, which works to understand the function and structure of glycans, or complex carbohydrates, usually found on the surface of cells. The ultimate goal of much of Pierce’s research is to identify cancer markers. For Viswanathan, who wants to pursue a career in health care, the Young Dawgs program offers the ability to apply scientific research beyond what high school can afford her. And that is just what she’s gotten, first as a summer intern and now during the fall semester. In Pierce’s lab, students do a lot with their hands-focusing on wet lab experiments, which use biological materials and chemicals. Members of Pierce’s lab, especially research technician Pam Kirby, help guide the students during their internships. Viswanathan said the real fun comes from watching chemical reactions and realizing that these reactions happen in the body. “Sometimes I’ll find myself doing lab work and wondering, ‘Well, what’s all of this for?’ ” she said. She’ll observe how a group of antibodies connects with a group of cells and start to piece together what that means for an immune system.